"These pancakes are a wonderful substitute for regular pancakes when you are watching your carbs! They are very filling and are on the dense side. This is a basic recipe can be tweaked. Any sweetener can be substituted for the maple syrup. Enjoy!" Whisk almond flour, water, eggs, maple syrup, and salt together in a bowl until batter is smooth. Heat oil in a skillet over medium heat; drop batter by large spoonfuls onto the griddle, and cook until bubbles form and the edges are dry, 3 to 5 minutes. Flip, and cook until browned on the other side, 3 to 5 minutes. Repeat with remaining batter. 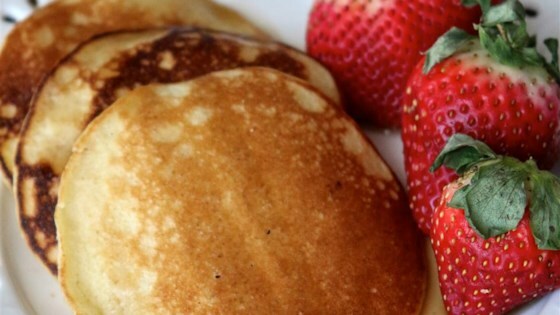 See how to make 5-star, completely gluten-free pancakes.